I have been a Stix2 demonstrator for almost a year but I have used Stix2 for as long as I can remember . I’m seriously thrilled I get to demonstrate such great products and still pinch myself. I’m also on 2 design teams which I love being part of too. I love how I can intermingle different craft products that I love and lots of things work so well together. I live in the West Midlands and spend hours in my craft room. 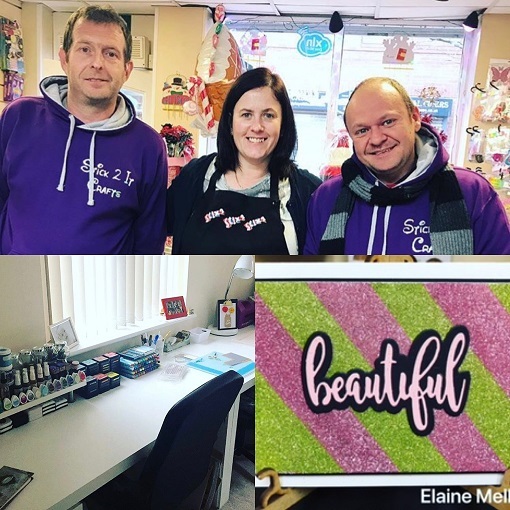 I travel to to demo days as far as north Nottingham visiting some amazing craft shops and meeting some fabulous people. Well I started crafting almost 12 years ago. I saw a simple handmade card and thought I would love to have a go. My first purchases were blank cards and peel offs. I’ve never looked back since. I love to make anything to be honest. If I’m creating I’m happy. I’m quite a tidy crafter but when I’m busy prepping it can get quite messy in my room. Well where do I start....Stix2 adhesives is a must and I use all different sorts depending on what I’m doing. I’m a massive fan of Stix2 card in every variety and colour and it’s on almost everyone of my makes along with the card blanks which are 300gsm and amazing. Finally my trusty guillotine and Sizzix big-shot, these are 11 years old and still going strong. I have met some truly wonderful people over the years and have made some amazing friends at my local craft shop where I go to craft once a week to relax with like minded ladies. I have to give a mention to the Stix2 team who have been so wonderful & supportive. Visit www.stix2.co.uk to see when Elaine is next demonstration.